In 1800, soon after the French Revolution, a priest, Fr. Vincent, founded the Congregation of the Holy Name of Jesus in Toulouse, and paved the way for it to carry the light to the little girls of France by the very necessary work of teaching and education. In 1885, a decisive move was made: Mother Helen Daguzan, then Mother General, affiliated the Institute to the Order of Saint Dominic. Indeed, she found moral support, sure guides and affinities with the Preachers: religious simplicity, apostolic spirit, thirst for the interior life, and ardent aspiration towards perfection. This affiliation turned out to be fruitful: in five years, fifty novices joined the Congregation! Later, when civil persecutions struck, Saint Dominic kept watch over them. So the sisters chose to be deprived of their religious habit, in order to be able to continue their mission of educating French children. Fifty years later, Mother Helen Jamet and Father Calmel, two great leaders of the Congregation, foresaw the reforms that were necessary to unify the sisters’ religious and teaching life, thus preparing them to resist the still hidden tempests which would soon be provoked by modernism. Elected Mother General in 1967, Mother Anne Marie Simoulin continued this fight with courage and lucidity, addressing the various domains in which it surfaced: the “carte scolaire,” [Translator’s note: With the “carte scolaire” the French bishops imposed the teaching of certain grades on one religious congregation and that of other grades on another congregation, thus depriving parents of a choice of schools for their children.] the new catechism, the overturning of religious statutes (observances, the Divine Office, the religious habit…) and the reform of the Mass (the Novus Ordo). 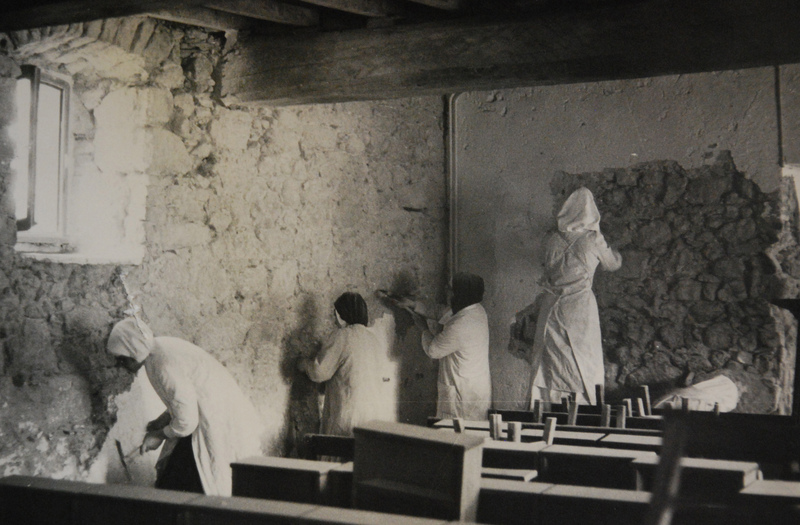 At that time, some sisters decided to leave: one group went to Brignoles in 1974, and another to Fanjeaux in 1975 under the direction of Mother Anne-Marie. Abandoned by their own, the sisters took refuge at “La Clarté-Dieu,” and found both support and guidance in the person of Monseigneur Lefebvre, who was engaged in the same combat. Their other source of help and light was a Dominican priest, the Reverend Father de Chivré, a true son of St. Dominic. An unfailing fidelity to the Catholic Church, to the Tridentine Mass in its integrality, to the traditional teaching of Catholic doctrine, and to the Dominican teaching life, such is the ideal which we pursue and by which we live day after day, an ideal deepened by mental prayer, the Divine Office, the rosary, and doctrinal study. Over forty years, our foundations have multiplied: from far and near, girls of all ages continue to call upon us.